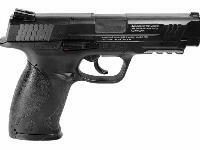 The S&W M&P (military & police) air pistol is a dead-ringer for the firearm handgun made by Smith & Wesson. If you like to use airguns to gain or retain proficiency for your firearms, this will help you do that. While the firearm will have more recoil, you'll still be able to get the feel of the gun, the weight, the handling characteristics...and more from shooting the air pistol version. Shoot either steel BBs or lead pellets through this CO2 gun. Things I liked: I really like the feel of this gun. 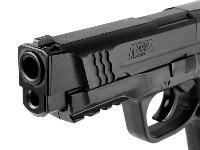 It is the same size as the firearm and feels good in the hand. The accuracy of this gun is excellent and I was surprised I could get 1 inch groups at 15 feet. The gun is actually more accurate than me. 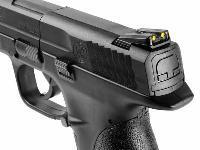 Also liked the 3 dot sights, which are yellow but are very easy to acquire. Things I would have changed: I would prefer an all metal piercing tab, the plastic tab is a bit of a struggle for my old hands. 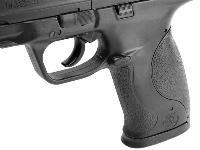 I would like a smoother double action trigger pull, however, its okay for a $65 gun. 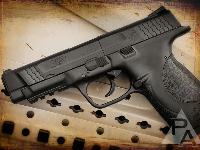 What others should know: The single action trigger pull is crisp and makes for excellent accuracy. The double action trigger pull is rather heavy. I did discover that the double action trigger pull was slightly better if the pellets are seated in the rotary magazine with a pellet seater. The gun is not pellet picky. 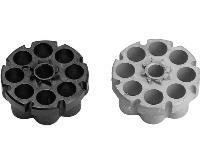 I got very good groups with Wadcutter, domed and hollow point pellets. 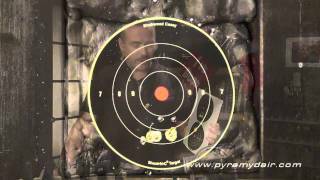 Using Umarex CO2 canisters I got 152 shots, but with Crosman CO2 canisters I got only 68 shots. I also had 2 Crosman CO2 canisters that would not seal and leaked out all the gas. I highly recommend using Umarex CO2 and avoid Crosman CO2. I have shot about 1,000 rounds through this gun and I am extremely happy with it. 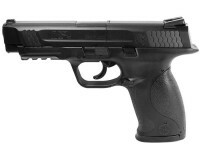 I recommend this gun for a fun plinker. As a follow up, I have discovered that using a pair or plyers to twist the piercing tab works for the crosman canisters. Although I did have one crosman canister that would not fully pierce and seal even using plyers and lost all of the CO2. Umarex and Daisy CO2 canisters work just fine. I shot another 300 rounds today and I am really enjoying this gun. Really glad I bought it. ?? Things I liked: I like that it's SA and DA or revolver/fake semi-auto or whatever. I like that it's not blow back as I want the CO2 just launching pellets - although in a airgun of this type there's some blow-by/loss. I like that the barrel is rifled so I will choose pellets every time over BBs. I like the rear sight is adjustable and that the sights are good enough that I'm able to produce 1"-1.5" groups of 5 at 50' often. Blasting small cans at out to 50'-60' is no problem. Figure 8 eight shot mags per CO2 - maybe 6 on a day in the 60s F. temps. 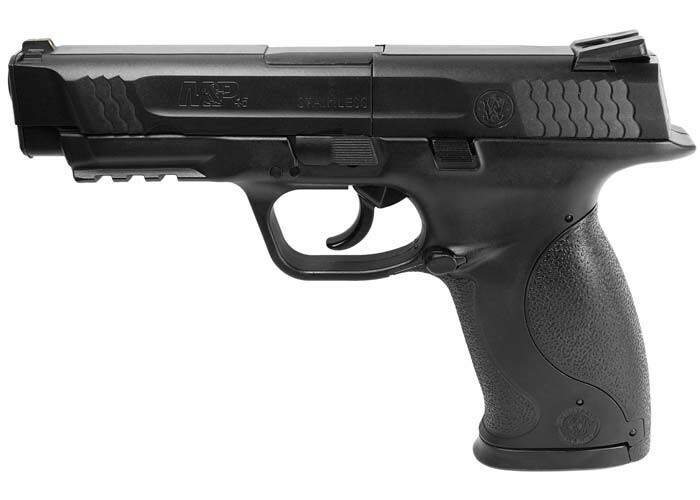 Could the bb mag be used in the berreta 92 fs? this gun should take care of rabbits, yes? No it is way too underpowered to allow an ethical kill on any small animals. If you want to shoot rabbits; you should get a Crosman 2240 -as it would be suitable at very close distances.